Teak wood is an extremely dense course grained hardwood and is widely known for its durability. Our Teak product is made from environmentally friendly Plantation Teak in Jakarta, Indonesia. This 5-Piece Octogon Folding Table Set includes one Teak Octogon Folding Table (TO48) and four Teak Folding Chairs (TF22). Features: Constructed of Java Teak; Mortise and Tenon joinery for exceptional strength and longevity; Solid brass fittings; Lightly stained with Teak oil; Fold Away design. 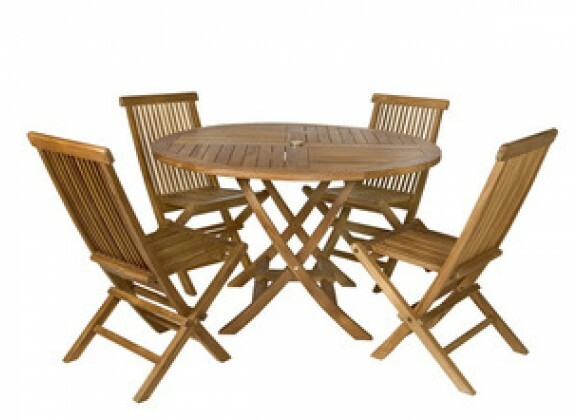 Includes one Teak Octogon Folding Table and four Teak Folding Chairs. Lightly stained with Teak oil.